These are basic rules that no operation where conveyor is utilized should ignore. Adhering to these rules is the start (bur certainly not the end) of successful conveyor safety programs. Don't perform service on conveyor until motor disconnect is locked out . 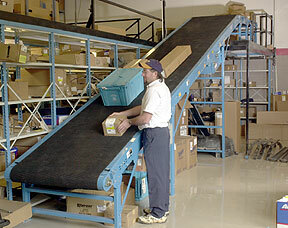 Service conveyor with only authorized maintenance personnel. Keep clothing, fingers, hair, and other parts of the body away from conveyor! Don't climb, step, sit or ride on conveyor at any time! Don't load conveyor outside of the design limits! Don't remove or alter conveyor guards or safety divides! Know location and function of all stop/start controls. Keep all stopping/starting control devices free from obstructions. All personnel must be clear of conveyor before starting. Operate conveyor with trained personnel only! Keep area around conveyors clear of obstructions.